Modern science has learned a lot about Earth’s past, and researchers have uncovered some surprising details that go against everything we take for granted. Details like . . . The end-Cretaceous extinction went something like the following, according to the most commonly held theory from the 1980s to today. First, dinosaurs ruled the world. 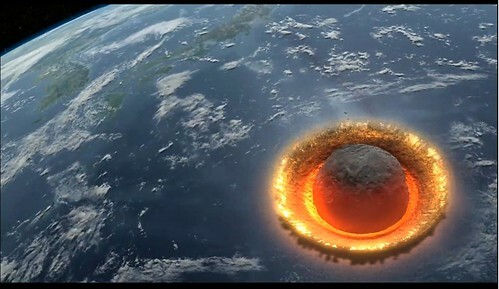 Then, a big asteroid crashed near modern-day Chicxulub, Mexico, sending Earth into a global winter. The age of dinosaurs ended, as 80 percent of Earth’s species perished. Then, mammals inherited the world. Ever since undeniable evidence showed an impact in the right place at the right time, researchers have accepted the explanation. Perhaps, they further reasoned, impacts had caused all of Earth’s mass extinctions. Everybody spread out into the field, looking for more craters. They found plenty, but most couldn’t be linked to a mass extinction. And in the meantime, questions have been raised about the end-Cretaceous extinction and that asteroid impact. Such a massive wallop should have killed off a lot of life all over Earth. Instead, some species survived—even dinosaurs, which later evolved into birds. Some explain this with a double whammy of the Chicxulub impact and contemporary extensive volcanic flooding from a region called the Deccan traps. The Deccan eruption, these experts say, made life difficult all over the world. Then along came the asteroid to deliver a coup de grace to the most stressed animal groups, including T. rex and its buddies. It’s a good argument, but not everybody buys it. Others researchers say that they have found evidence of dinosaurs thriving right next to the Deccan volcano while it erupted, even nesting on its lava. These experts also say that at the end of the age of dinosaurs, Earth was hit by several big impactors—asteroids or comet fragments—over a short span of time. Chicxulub was in there, but the biggest one was Shiva, three times as big as Chicxulub. When Shiva hit our planet off the western coast of modern India, its impact was massive enough to change how plate tectonics operated in the area. The nearby Deccan eruption then went into overdrive, and a mass extinction followed. So take your pick. Was it Chicxulub, Chixculub plus volcanism, or the Shiva space barrage plus volcanism that shut down the age of dinosaurs? No one knows for sure. Too much speculation for a science article. Maybe this, maybe that. Maybe ants, maybe Mars. Please try to do better in the future.